Lots of people, even abroad, look at New Zealand’s economy. For example, there are ratings agencies selling a commercial product to clients, and there are investment funds putting their own and clients’ money at risk. And then there are the government agencies; notably the IMF and the OECD. Every year or so, a small team of IMF economists come to visit for their Article IV assessment. New Zealand isn’t very important to the Fund: we aren’t systemically important, we don’t borrow money from the Fund, and we aren’t even part of any of the country groupings with traditional clout at the Fund (eg the EU or euro-area). And the New Zealand story is complicated – there aren’t other countries much like New Zealand to compare us against and learn from, and especially not in the Asia-Pacific region (the department of the IMF that covers New Zealand). There isn’t much incentive for the Fund to spend much time on New Zealand, or to devote their best people to New Zealand issues, or to do much other than pay polite deference to the preferences of whoever happens to hold office (bureaucratic and political) at the time, spout some conventional verities favouring smart government intervention, while burying any scepticism in very careful drafting. We might deserve better than we get – after all, we are a member just like all the other countries – but to expect better would be to let wishful thinking triumph over (very) long experience. But because the IMF’s report on New Zealand is published, and because the mission chief makes themselves available to the local media, the IMF team’s views tends to get some local media coverage. The latest report – in this case the three page concluding remarks from the just-completed mission – came out yesterday. New Zealand has enjoyed a solid economic expansion in recent years. Construction and historically high net migration have been important growth drivers. Accommodative monetary policy, increasing terms of trade, and strong external demand from Asia have supported activity more broadly. As it happens, on the IMF’s own numbers, growth in real per capita GDP in New Zealand over the last five years has been nothing spectacular – among advanced countries we’ve been the median country and the advanced world hasn’t done that well. And nowhere in the report do they even allude to the fact that almost all that New Zealand growth has resulted from more inputs, and that productivity growth has been near-zero for much of the last five years. From an international organisation that emphasises the importance of open trade etc, there is also no mention at all of the fact that exports and imports have been shrinking as a share of GDP. They also tell us that “the baseline economic outlook is favourable”. Perhaps, but their own numbers say something a bit different. 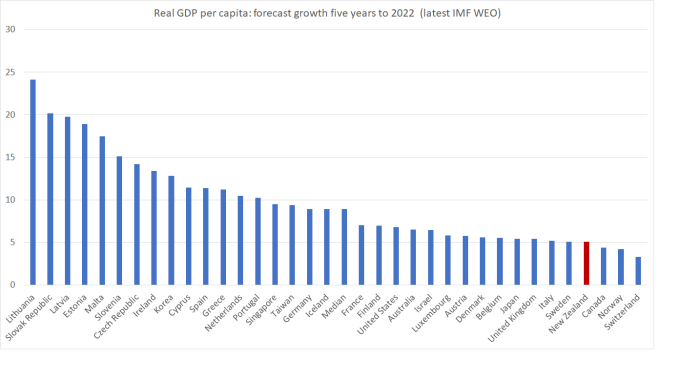 Here is the IMF’s own forecasts for growth in real per capita GDP for the five years from 2017 to 2022. Not only do they forecast New Zealand’s growth rate to slow (whereas the median country’s growth rate is forecast to accelerate) but on these projections we are expected to have one of the slowest (per capita) growth rates of any advanced country over the next five years. Perhaps there is some productivity miracle embedded in these numbers – the IMF doesn’t produce the breakdown of their growth forecasts – but it looks as though they expect another half decade when we drift a bit further behind. Strangely, none of that showed up in ysterday’s statement. What of macro policy (monetary and fiscal)? Current monetary policy is appropriately expansionary. The policy settings are robust to current uncertainties. A precautionary further easing would raise risks of a steeper tightening if inflationary pressures emerged sooner than expected, given that the economy appears to have been operating close to capacity for some time. On the other hand, a premature tightening could prolong price setting below the mid-point of the target range, given persistently low inflation in recent years. But this is pretty vacuous. Getting policy wrong is, rather obviously, a bad thing. But it is nonsense to suggest that current policy is “robust to current uncertainties”. After all, if inflation ends up staying persistently low, then not to have eased earlier would have risked inflation expectations falling away, and more people being unemployed than necessary. All they are really saying is “we believe – as we have for years, wrongly – that inflation is about to start rising back to the target midpoint, and if so current policy will prove to have been appropriate”. But this was the same organisation that only a few years ago was cheerleading for the ill-fated 2014 Wheeler tightening. The strong fiscal position provides space to accommodate the needs from strong economic and population growth. Compared to the time of the last Article IV Consultation, the updated baseline expenditure path already incorporates higher infrastructure spending and new growth-friendly measures, as discussed below. The continued political commitment to budget discipline and a medium-term debt anchor in New Zealand is welcome. With the country’s strong fiscal position, there is no need for faster debt reduction beyond that outlined in the 2017 Half Year Economic and Fiscal Update. Stronger structural revenues, such as from higher-than-expected population growth, should be used to increase spending on infrastructure and other measures that would strengthen the economy’s growth potential. This paragraph just exemplifies how the IMF has – at least for tame untroublesome countries – ended up too often as a mouthpiece rehearsing the preferred lines of whoever holds office at the time. Contrast the tone with these lines from last year’s statement. Current budget plans appropriately imply a counter-cyclical fiscal stance going forward. Stronger-than-expected revenue for cyclical reasons should be used to reduce public debt. Household debt-related vulnerabilities are expected to decrease following recent stabilization. Macroprudential policy intervention contributed to slowing household debt growth, and momentum in house prices moderated last year. While housing demand fundamentals remain robust under the baseline outlook, the soft landing in the housing market should continue, reflecting increasing supply and, in the medium term, gradually rising domestic interest rates. But then later in the report they talk at some length about the various measures – some concrete, some (at this stage) still promises – the government is planning to affect the housing market. Perhaps the IMF doesn’t believe those measures will actually do much, in aggregate, but there is no discussion at all about how fixing the housing market would (desirably) actually lower house and urban land prices. Stress tests the Reserve Bank has undertaken suggest banks can cope with big price falls, but the possibility of such an adjustment doesn’t even rate a mention in this statement. The proposed ban in the draft amendment to the Overseas Investment Act is a capital flow management measure (CFM) under the IMF’s Institutional View on capital flows. The measure is unlikely to be temporary or targeted, and foreign buyers seem to have played a minor role in New Zealand’s residential real estate markets recently. The broad housing policy agenda above, if fully implemented, would address most of the potential problems associated with foreign buyers on a less discriminatory basis. But, as I noted, in the unlikely event that a broad housing policy agenda was fully implemented, it would be likely to lower house prices considerably, which surely should rate a mention from the IMF? The IMF doesn’t know a lot about structural policies – ones that might actually make a difference to productivity (indeed, in New Zealand’s case it is either unaware – or too polite to mention – pressing productivity failures). But that doesn’t stop them devoting a fair chunk of a short report to what they call “Supporting Productivity and Inclusive Growth”. Here, I think it is fair to say, they aren’t entirely convinced. 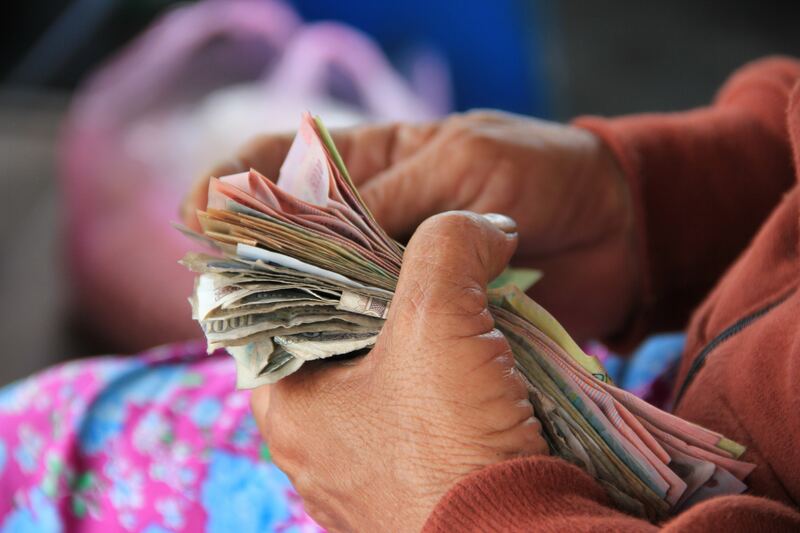 The proposed minimum wage increases out to 2020 could help ease income inequality. Free tertiary-level education and training for at least one year could boost human capital. Tax reform could play an important role in shifting incentives toward broader business investment. Again…not a great of confidence that these things “would” make a difference. Then again, there is little sign that the IMF team really understands the issues. The new Provincial Growth Fund should ensure project selection that helps regions to benefit from income gains more in line with the major urban centers. It can also be an appropriate tool to relieve pressures on the major urban areas by encouraging movement of population into the regions. It would be interesting to see the IMF’s analysis justifying government interventions to try to encourage people out of the cities. Ideally, people will flow towards economic opportunities……which either haven’t been there in some of the regions the government worries about, or which the government is in the process of taking away (eg oil and gas exploration). There is just one element of this structural agenda the IMF is sure of, as both the IMF and OECD have been for years. The agenda appropriately focuses on lifting R&D spending in New Zealand to 2 percent of GDP. An R&D tax credit, if well designed, would be an efficient instrument to support R&D spending in the business sector. Note that change of wording: “would”. I guess such a scheme “will” put money in the pockets of some firms. But whether it encourages more worthwhile R&D – and surely the most worthwhile R&D most already be being done – is another matter. And there is no sign that the IMF has ever considered what structural reasons there might be why firms in New Zealand – or considering being in New Zealand – haven’t found it profitable to undertake more R&D spending. Astonishingly, writing about in a country with a real exchange rate persistently out of line with widening productivity differentials, there is no mention of the real exchange rate at all. And if anything is IMF territory, surely it would be exchange rates? In the end, these days I wouldn’t think better or worse of a policy position because a visiting IMF team favoured it, or opposed it. After all, on macro policy quite possibly the position they hold today will be reversed next year (as we’ve seen happen on fiscal policy). On other things, they show little sign of having thought hard about the New Zealand issues. That’s a shame, but it seems to be a fact of life now.